This page explains how to travel from Dubrovnik or Split to other European cities, buying tickets the cheapest way. Although Dubrovnik has no railway station, it's just a few hours by bus north to Split for trains to Zagreb, or south to Podgorica for trains to Belgrade. Click here to buy tickets starting in another city. Step 1, take a bus from Dubrovnik to Split. Buses leave Dubrovnik bus terminal every hour or even every half hour and take between 3h45 and 4h35 to Split bus terminal. There are various operators, the fare is between €13 and €17. Buy at the bus station on the day, it's easy. Step 2, take a train from Split to Zagreb, allowing at least an hour between bus and train in case of delay. There are one or two daytime trains every day. A train leaves Split at 08:33 all year round and in summer (mid-June to early September) a second train leaves Split at 14:20. Journey time around 6h13. The fare is 208 Kuna (€28) in 2nd class or 303 Kuna (€41) in 1st class, full-price even bought on the day at the station. 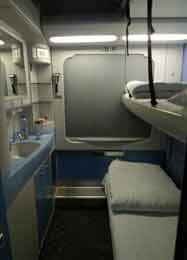 There's also a sleeper train, leaving Split at 21:54 every day and arriving Zagreb at 05:49. This has 6-berth couchettes and a comfortable sleeping-car with 1, 2 & 3 bed compartments. You can check train times & fares and buy tickets between Zagreb & Split at Croatian Railways www.hzpp.hr. You print your own ticket. Taking the daytime train is a great option, as Zagreb to Split is a very scenic train ride, with mountains, lakes, rivers, and even vineyards. The trains are modern and air-conditioned. ICN trains tilt round the bends on this mountainous route, cutting the journey time to 6 hours from a previous best of around 8 hours. 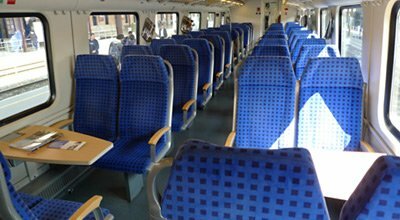 Seat reservation is compulsory on ICN trains. Sit back with a good book and a beer and enjoy the ride... For photos click here. See the Trains from Zagreb page for onward travel from Zagreb to Venice, Switzerland, Austria, Germany, Budapest, Prague, Paris, Brussels, Amsterdam. 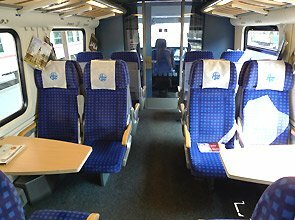 The daytime trains to Split: These fast, tilting, air-conditioned ICN trains link Zagreb & Split once or twice a day through great scenery. Above right, first class seats on the train to Split. below left, second class seats. Scenery between Zagreb and Split seen from the train... Photo courtesy of Páraic Maguire. 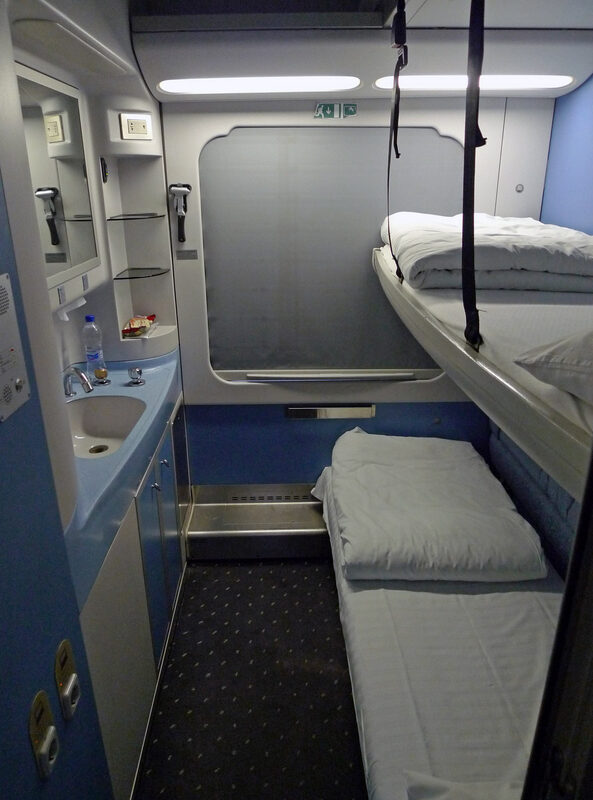 The overnight train to Split: The overnight train from Zagreb to Split has a modern air-conditioned sleeping-car with 1, 2 & 3-bed compartments with washbasin - See larger sleeper photo. Step 2, take a train from Split to Zagreb as shown above, allowing at least an hour between bus and train in case of delay. For example, you could take a morning bus from Dubrovnik to Split and the afternoon train from Split to Zagreb, then stay overnight in Zagreb. Step 3, take a EuroCity train from Zagreb to Budapest as shown here, or from Zagreb to Vienna as shown here or Zagreb to Prague as shown here. Step 2, there's a direct sleeper train from Split to Budapest which runs in summer from 15 June to 7 September 2019, leaving Split at 18:30 and arriving Budapest Keleti at 09:09 next morning, a comfortable & time-effective option. It has a comfortable Hungarian sleeping-car (1, 2 & 3 bed compartments with washbasin) and a couchette car (4 & 6 bunk compartments). This train cannot be booked online (except as part of a round trip from Budapest using the Hungarian Railways website with ticket collection in Budapest), so buy at the station or by phone. From Dubrovnik to Budapest you could consider travelling via Podgorica and Belgrade over the spectacular Podgorica-Belgrade railway, see the section below. Then see the Belgrade to Budapest information here. Step 1, buses link Dubrovnik with Podgorica once or twice a day, usually early morning and evening, journey time 5h or 6h, fare between €18 & €30 depending on which company you use. Check times and buy online at a site such as https://getbybus.com. I'd allow at least a couple of hours between your bus arrival and your train departure. 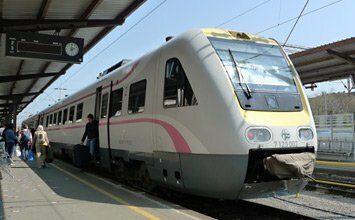 Step 2, travel from Podgorica to Belgrade for around €21 on one of Europe's most spectacular railways, see the train times, fares, photos, video & advice on the Belgrade-Bar Railway page. There's a daytime train and a sleeper train, the sleeper is time-effective but the day train is a scenic treat. See the Trains from Belgrade page for onward travel from Belgrade to Budapest, Sofia, Istanbul, Bucharest. Spectacular scenery on the wonderful Belgrade to Montenegro railway. Step 1, sail across the Adriatic from Dubrovnik to Bari in Italy with Jadrolinija. The ferry sails between 2 & 6 times a week, usually overnight leaving Dubrovnik at 22:00 and arriving Bari port at 08:00. There are a range of comfortable cabins on board, as well as reclining seats, bar & restaurant. However, times and days vary by season, so check times, prices and book online at www.jadrolinija.hr or use the seat61 ferry shop. In Bari, it's a 25 minute walk or 10 minute taxi ride from port to Bari Centrale station. Step 2, take a train from Bari Centrale to Naples, Rome, Milan or any other Italian destination. I'd allow at least 2-3 hours between scheduled ferry arrival and the train departure you book. Bari to Rome takes 4h06 with fares from €29.90 in 2nd class or €39.90 in 1st class. For example, there's usually a 13:14 from Bari arriving Rome Termini at 17:20. You can buy Italian train tickets using either www.italiarail.com (easy to use, in €, £, $ or Au$) or www.trenitalia.com (in €). Italiarail will refund their small booking fee if you email them at seat61@italiarail.com with your booking reference. For fast trains it's ticketless, you just quote your booking reference on board. If ferry sailings don't suit you, by all means take a bus from Dubrovnik to Split (3h45 to 4h35) and sail from there to Ancona instead, as below. Step 1, sail across the Adriatic from Split to Ancona in Italy with Jadrolinija. The ferry sails between 2 & 6 times a week, usually overnight leaving Split around 20:00 and arriving Ancona port around 07:00. There are a range of comfortable cabins on board, as well as reclining seats, bar & restaurant. However, times and days vary by season, so check times, prices and book online at www.jadrolinija.hr or use the seat61 ferry shop. In Ancona, it's a fairly long taxi or bus ride from port to Ancona station. Step 2, take a train from Ancona to Naples, Rome, Milan or any other Italian destination. I'd allow at least 2-3 hours between scheduled ferry arrival and the train departure you book. Ancona to Rome takes around 3h50 with fares from €29.90 in 2nd class or €39.90 in 1st class. For example, there's usually a 13:45 from Ancona arriving Rome Termini at 17:48. If heading to Austria, Germany, Switzerland, Paris, Brussels, Amsterdam and all points north and west, take a bus to Split then train to Zagreb as shown above. If heading for to Sofia, Istanbul, Romania or Budapest, take a bus to Podgorica then train to Belgrade as shown above. Step 2, see the Trains from Zagreb page for onward travel from Zagreb or see the Trains from Belgrade page for onward travel from Belgrade. Step 1, take a train to Zagreb as shown above - although if you're going to Belgrade you could consider taking a bus to Podgorica then train to Belgrade. Step 2, see the Trains from Zagreb page for onward travel from Zagreb.